Sometime in elementary school I was introduced to rock and heavy metal music and the effect of these genres to my juvenile self still echo to this day. 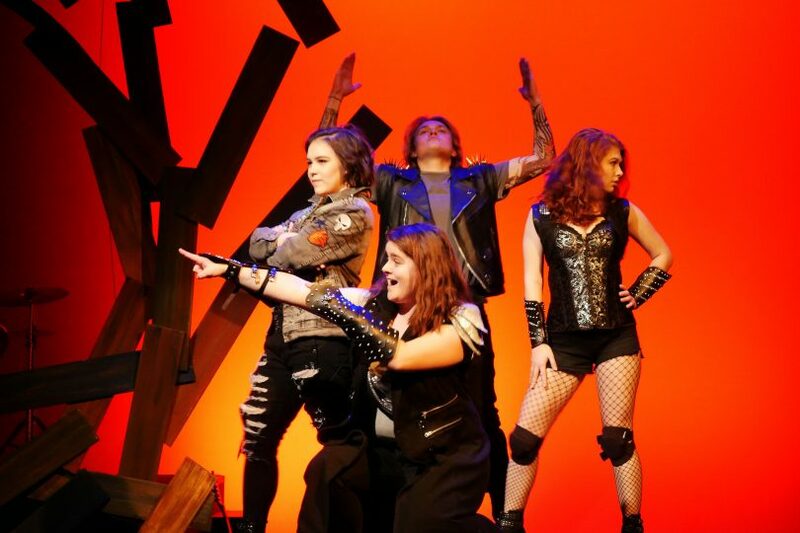 How could I then miss the Department of Theatre and Dance’s production of contemporary playwright Emma Goidel’s “Local Girls” — a story centered around the current high-school metal scene in Georgia? The play opens with small-town high-schooler Diskit, a lonely chemistry genius. She soon meets Riley, a burnout with dreams of becoming a legend, and joins Riley’s band as its new “screamer.” Together with Shanice and Ro, Diskit and Riley compete in the “Battle of the Bands,” a contest that Riley hopes will skyrocket the band’s status and secure a successful, life-long career in music. As the relationship between Diskit and Riley grows increasingly intimate, each learns vital lessons from the other, and from more secondary characters, about career, fulfillment, and life as a whole. 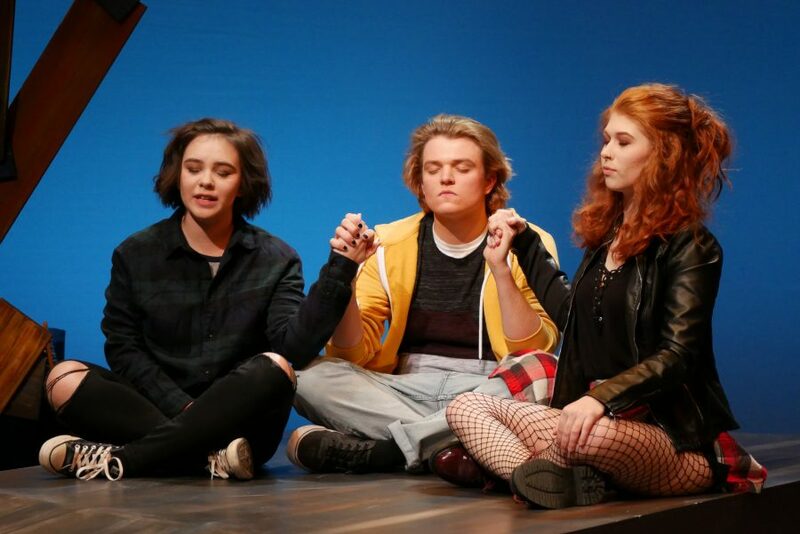 West Chester University’s rendition of Goidel’s stage play is directed by Associate Professor Dr. Leonard Kelly and stars Taylor Mattes, Coral Reef Sabedra, Austin Carlson, Annika Jorgensen and Alex Harding. The production also includes three “roadies,” played by Sarah Ford, Clare McKernan, and Elizabeth Powell, a band, comprised of Shane Wilson, Sarah Benson, Alex Harding and a superbly-talented production staff. Besides a piano that serves as both a musical instrument and a dining-room table, and a raised platform that aids in making performances accessible to audiences all around the room, the stage is mainly comprised of an interesting and elaborate artwork that looks like a giant portal and instantly catches the eye. Not only are the set and the colorful lighting that permeates the production beautiful, but they also help showcase the performances, which — alongside, of course, the exhilarating music — are what makes the play so heartfelt and hilarious. In fact, the humor is unquestionably the best part of the play. Multiple times throughout the production, I found myself audibly laughing a couple of times so loud that I feared bothering audience members around me. The play’s humor may be described as slapstick, ironic and playful; much of it certainly is “high-school humor.” However, lines are delivered with such grace and nuance that the play never crosses the line that leads to absurdity, or what the internet loves to call “cringy.” Instead, the banter on stage works every time and makes the play feel incredibly fast-paced during most of the production. The only parts of the play that did not, however, feel fast-paced were some of the more serious scenes. Photo courtesy of Ashley Sigerson. Although there exist a handful of standouts in that respect — mainly, a heated argument between Diskit and Riley and the adorable, heartfelt final scene between the same two characters — most of the play’s attempts to be sad, somber, or even philosophical fall flat. There is nothing outright terrible about those scenes, but most of the “depth” that is attempted in them — such as inspirational speeches about having big dreams and life’s many roadblocks — has been done countless times before. There is nothing novel about the way this production tackles these themes. Thus, parts of the play drag and feel like they are just missing something. Several times — especially during some of the scenes between Diskit and her dad, and the ones where Diskit tutors Riley in chemistry — I found myself yearning for the scene to change, so that I could see the band members tease each other or rock out again. Overall, West Chester University’s latest production, like the previous two of this school-year, is certainly worth experiencing. Although a handful of scenes may have you checking your watch, the hilarious comedy and explosive metal energy of “Local Girls” will likely amuse and intoxicate you. If you are interested in seeing the Department of Theatre and Dance’s rendition of this fresh play, then make sure to purchase your ticket at www.wcupatix.com/theatreanddance or at the E.O. Bull Center box office; prices range from $13 to $16. There are still showings on March 6th and 7th, at 7:30 p.m., in the E.O. Bull Center’s Main Stage Theatre. The play runs for about an hour and a half and contains no intermission.